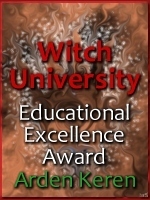 Arden Keren has won the Witch University Educational Excellence Award. He has an excellent website in Hebrew with great recipes, lore, and insights into a variety of spiritual traditions and practices. It is, by far, one of the best websites on the subject of witchcraft in Hebrew. Keep up the good work, Arden! arden, arden keren, educational excellence, facebook, facebook pages, facebook pages on witchcraft, hebrew, keren, practical witchcraft, witchcraft, witchcraft in hebrew. Bookmark.